On behalf of the Secretariat of the Basel, Rotterdam and Stockholm Conventions, hosted by the UN Environment Programme here in Geneva, it is a pleasure and an honour for me to be part of the 2018 World Environment Day celebration here today to look at solutions to beat plastic pollution. The Basel Convention - on the control of transboundary movements of hazardous waste and their disposal - aims to protect human health and the environment against the adverse effects of hazardous wastes and ‘other wastes’ - namely household wastes and incinerator ash. The Basel Convention covers many issues which are at the heart of preventing and minimizing the generation of wastes, including those ending up in the ocean. Much of the marine litter and microplastics found in the sea may be determined as “waste” as defined under the convention, although not all will necessary fall within this definition. Marine litter is a transboundary issue. Parties are to therefore take measures to ensure that the generation of hazardous and other wastes is reduced to a minimum; and to ensure the availability of adequate disposal facilities for the environmentally sound management of hazardous wastes and other wastes. 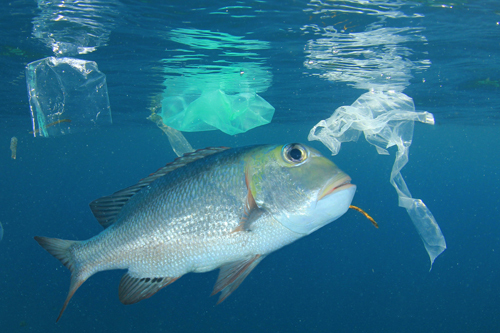 Under the Basel Convention, a number of guidance documents addressing issues related to marine plastic litter and microplastics have been developed with focus on environmentally sound management, efficient strategies for achieving the prevention and minimization of the generation of hazardous and other wastes, and their disposal including improving the sea-land interface. The Stockholm Convention on Persistent Organic Pollutants – or POPs - is also aimed at protecting human health and the environment from chemicals knowns as persistent organic pollutants. These are organic chemicals that persist in the environment, bioaccumulate in humans and wildlife, have harmful effects, and have the potential for long-range environmental transport. Exposure to POPs can cause serious health problems including certain cancers, birth defects, dysfunctional immune and reproductive systems, greater susceptibility to disease and even diminished intelligence. As of 2018, the convention controls 28 POPs, including those which have been used as additives, flame retardants or plasticizers in plastics. Plastics can adsorb POPs such as PCB, DDT and dioxins and these are frequently detected in marine plastic litter. In 2017 the Basel Convention Conference of Parties decided that its subsidiary body, the Open-ended working group should consider relevant options available under the convention to further address marine plastic litter and microplastics. That group will meet in September 2018 here in Geneva. The new Household waste partnership established under the Basel Convention at the same time, explores the environmentally sound management of household waste including plastics, while the global network of Basel and Stockholm Conventions’ regional centres explores measures for the prevention and environmentally sound management of plastic wastes, marine plastic litter and microplastics. Just last week staff from the Secretariat contributed to the 1st meeting of the UN Environment Ad-Hoc Expert Working Group on Marine Litter in Nairobi. The BRS Secretariat is thus very busy facilitating and participating in international policy efforts and actions to beat marine pollution. It’s a pleasure and an honour to be here and to learn from such an interesting panel of innovators, explorers, and entrepreneurs. “If you can’t reuse it – refuse it”.